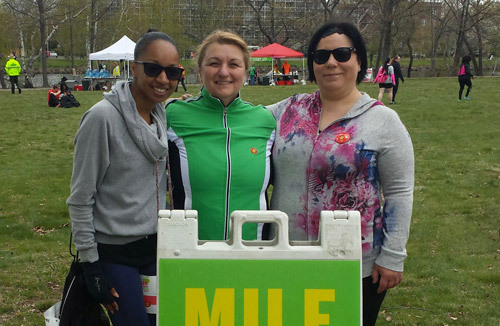 Boston, MA (May 5, 2016) – Vinda Butler, Hamida Colic and Yulia Shakurova, were among the more than 40,000 participants and 2,000 volunteers who recently took part in Project Bread’s 48th annual Walk for Hunger to raise awareness of and funds for critical hunger relief programs serving families and individuals across Massachusetts. This dedicated team from Peabody Resident Services, Inc. (PRSI), a division of full service real estate firm Peabody Properties, Inc., is dedicated solely to the development of support services and programs for residents of affordable housing. The walkers, dubbed team “Back on our Feet”, are all employees of PRSI’s Group Adult Foster Care (GAFC) Program, which provides residents with daily services including personal care, housekeeping, laundry, shopping, meals, transportation coordination and case management. In keeping with PRSI’s commitment to giving back to the community, the Back on our Feet team took to the streets of Boston on Sunday, May 1st and helped raise $900 for Project Bread, which supports in excess of 400 programs in more than 120 communities across Massachusetts. This was PRSI’s fourth time participating in the Walk for Hunger. Pictured above (left to right): Peabody Resident Services, Inc. Group Adult Foster Care Program Resident Service Coordinators Vinda Butler, Hamida Colic and Yulia Shakurova.